2016 Corvette Z06 Highlights and Details - MacMulkin Corvette - 2nd Largest Corvette Dealer in the World! When the Z06 rejoined the Corvette lineup in 2015 as the most capable model in the car’s long, storied history, it also joined an elite fraternity of the world’s most capable supercars. It returns for 2016, offering more choices for personalization to complement its world-class levels of performance – including an all-new C7.R Edition. The C7.R Edition pays tribute to the Corvette Racing C7.R racecars. It’s offered in Corvette Racing’s signature yellow livery – or black – with coordinated exterior and interior accents. Only 500 will be built, all with the Z07 Performance Package with carbon ceramic brakes, and a specially serialized vehicle identification number. Additionally, three all-new color-themed design packages – Twilight Blue, Spice Red and Jet Black Suede – offer custom-tailored appearances that elevate the Z06’s presence on the street or track, while features such as an available front parking camera and power-cinching latch for the coupe’s hatchback or convertible’s trunk enhance convenience – and add an extra measure protection. New smartphone projection technology on Corvette Z06’s MyLink system displays content from Apple iPhone 5 or later models on the multicolor screen through the Apple CarPlay feature. Supported apps for the system include phone, messages, maps, music and compatible third-party apps. New Performance Data Recorder icon on the MyLink screen (if equipped). 60-0 mph braking in only 99.6 feet – the best of any production car tested by General Motors. The 2016 Corvette Z06 is offered in coupe and convertible models, in 1LZ, 2LZ and 3LZ trims. Corvette Racing’s legacy and technology were a significant influences on the development of the Corvette Z06 and the new C7.R Edition honors the link between the racecar and the production model. The three new design packages offered on 2016 Z06 offer customers more choices for a tailored look and feel of their Corvette. Each gives the vehicle a distinctive, customized appearance that reflects the different roles the Corvette plays in different customers’ experiences – from high-performance to grand touring. Each is offered on Z06 3LZ coupe and convertible models with the following details. Special Twilight Blue full-color interior color. Special Spice Red full-color interior color. Carbon fiber (high gloss) interior trim plate. New for Corvette Z06 in 2016, Chevrolet’s new MyLink system with an 8-inch-diagonal color touchscreen is compatible with Apple CarPlay, which puts iPhone features (iPhone 5 and later) on the display in a smart, simple manner, allowing drivers to make calls, send and receive messages and listen to music right from the touchscreen or by voice via Siri. That helps drivers spend more time with eyes on the road and hands on the wheel. The performance targets of the Z06 also posed a challenge for the design team, which had to create a striking design that also contributed to increased capabilities. The design changes began not with the exterior panels, but the tires. To deliver the levels of grip needed for the Z06’s performance targets, the car is fitted with larger Michelin tires (Pilot Super Sport tires for the Z06; Sport Cup 2 tires with the Z07 package). The P285/30ZR19 front tires are 1.5 inches wider than the tires on the Stingray, while the 335/25ZR20 rear tires are two inches wider. And to cover the wider tire tread, the fenders of the Z06 were extended by 2.2 inches (56 mm) at the front, and 3.15 inches (80 mm) at the rear. These extensions give the Corvette Z06 a wider, lower appearance further emphasized by a unique rear fascia. It incorporates the same taillamp assemblies as the Stingray, but on the Z06 the taillamps are pushed approximately three inches farther apart, toward the edges of the body. The exterior design also reflects the increased cooling required for the new Corvette Z06. For example, the mesh pattern on the front fascia was painstakingly designed to deliver the most possible airflow to the supercharger’s intercooler heat exchanger, so much so that the mesh grill directs more air into the engine bay than if the grille was removed. Additional cooling elements include larger front fender vents and unique air blades over the inlets on the rear fenders of Coupe models, which force about 50 percent more air into the cooling ducts for the transmission and differential coolers than those on the Stingray. Convertible models feature under-body inlets. To cope with the additional airflow, Z06 Coupe and Convertible also have larger rear-fascia openings than the Stingray. Standard front and rear brake-cooling ducts, including Z06-signature rear ducts integrated in front of the rear fender openings, are also part of the functional design changes over Stingray models. Ten exterior colors are offered: Laguna Blue Tintcoat, Daytona Sunrise Orange Metallic, Corvette Racing Yellow Tintcoat, Arctic White, Blade Silver Metallic, Black, Shark Gray Metallic, Long Beach Red Metallic Tintcoat, Torch Red and Night Race Blue Metallic. The seventh-generation Corvette Z06’s aluminum structure is 20 percent stiffer than the previous, fixed-roof Z06. As there are no structural reinforcements needed for the Z06 Convertible, it has a nearly identical curb weight as the Z06 Coupe. They also share the same chassis tuning, powertrain output, driver technologies and equipment options – including the track-focused Z07 Performance Package. Like the structure, there are only minor design changes from the Z06 Coupe to Convertible. The convertible features a fully electronic top that can be lowered remotely using the car’s key fob. The top can also be opened or closed on the go, at speeds of up to 30 mph (50 km/h). With the top up, the Z06 Convertible is designed for a refined driving experience. A thick fabric top – offered in four colors – with sound-absorbing padding and a glass rear window contribute to a quiet cabin and premium appearance. With the top down, the Corvette’s signature profile is further accentuated. Behind the seat backs, dual Carbon Flash-painted or available carbon fiber accent panels enhance the character lines of the tonneau cover. Corvette Stingray’s signature “waterfall” design originates in the valley between the nacelles, bringing the exterior color into the interior. The power-operated tonneau cover necessitated moving the air intakes for the differential and transmission coolers, from the rear quarter panels on the Z06 Coupe to the underbody of the Z06 Convertible. Otherwise, both models share the same, performance-driven aesthetic. Like the Stingray, the Z06 will be offered with two seating choices: a GT seat, for all-around comfort, and a Competition Sport seat with more aggressive side bolstering, which provides greater support on the track. The frame structure for both seats is made of magnesium, for greater strength. They’re also more rigid, contributing to the enhanced feeling of support during performance driving. 3LZ: GT seats with perforated Napa leather seating surfaces; Competition Sport seats with perforated Mulan leather seating surfaces; GT or Competition Sport seats with leather seating surfaces and sueded microfiber inserts. Interior colors: Dark Gray, Blue, Jet Black, Kalahari and Adrenaline Red – and, new for 2016, Brownstone is available on 3LZ. The heart of the Corvette Z06 is the all-new LT4 6.2L supercharged V-8 engine, expected to deliver an SAE-certified 650 horsepower (485 kW) and 650 lb-ft of torque (881 Nm). To balance performance and efficiency, the LT4 leverages the same trio of advanced technologies introduced on the Corvette Stingray: direct injection, Active Fuel Management, or cylinder deactivation, and continuously variable valve timing. A 1.7L supercharger spins at up to 20,000 rpm – 5,000 rpm more than the supercharger on the Corvette ZR1’s engine. The rotors are smaller in diameter, which contributes to their higher-rpm capability – and enables them to produce power-enhancing boost earlier in the rpm band. That boost is achieved more efficiently via a more direct discharge port that creates less turbulence, reducing heat and speeding airflow into the engine. The supercharged LT4 is offered with a standard seven-speed manual transmission with Active Rev Match or the 8L90 eight-speed paddle-shift automatic transmission designed to enhance both performance and efficiency. For performance driving, the transmission offers full manual control via steering wheel paddles, and unique algorithms to deliver shift performance that rivals the dual-clutch/semi-automatic transmissions found in many supercars – but with the smoothness and refinement that come with a conventional automatic fitted with a torque converter. Featuring four gearsets and five clutches, creative packaging enables the GM-developed eight-speed automatic to fit the same space as the six-speed automatic in the Corvette Stingray. Extensive use of aluminum and magnesium make it more than eight pounds (4 kg) lighter than the six-speed. Along with design features that reduce friction, the 8L90 is expected to contribute up to 5-percent greater efficiency, when compared with a six-speed automatic. 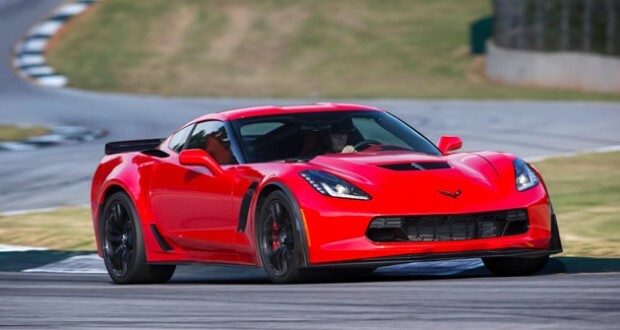 The Corvette Z06 leverages the technologies introduced on the Corvette Stingray, including the strategic use of lightweight materials and advanced driver technologies, with unique features and calibrations tailored for its capabilities. Its aluminum frame is produced in-house at General Motors’ Bowling Green assembly plant. It’s the same robust, lightweight frame used on the Corvette Stingray and it is used essentially unchanged for the C7.R race cars. The new Z06 retains the SLA-type front and rear suspension design of the Corvette Stingray but is uniquely calibrated for the higher performance threshold. The third-generation Magnetic Selective Ride Control dampers are standard on Z06. They can be adjusted for touring comfort or maximum track performance via the standard Driver Mode Selector. Electronic Limited Slip Differential: Adjusts the rate at which the limited slip engages to balance between steering response and stability in different driving conditions with more aggressive performance in Sport and Track modes. The PDR system includes three major components, all seamlessly integrated into the Corvette Z06’s interior. First is a high-definition camera, mounted within the windshield header trim, which records the driver’s point-of-view through the windshield. Audio is recorded via a dedicated microphone in the cabin. Track Mode – shows the maximum level of data on the screen, including speed, rpm, g-force, a location-based map, lap time and more. The video can be viewed on the Corvette Z06’s eight-inch color touchscreen when the car is parked, or downloaded to a computer for further editing, and sharing video via social media sites. For users who want a more in-depth understanding of their performance, the PDR vehicle data can be opened in the included “Cosworth Toolbox” software, which combines Cosworth’s professional-level motorsport data analysis with an easy-to-use graphic interface. The Corvette Z06 is built at GM’s Bowling Green, Ky., assembly plant.